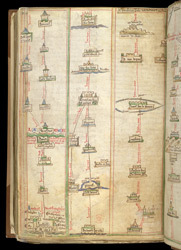 Reading from left to right, and from bottom to top, this diagram illustrates the route from London towards Apulia. The journey starts at London Bridge ('pons Lond.') and the Thames ('Tamise'), and goes though Rochester and Canterbury to get to Dover, before crossing the sea ('La Mer') and reaching France.